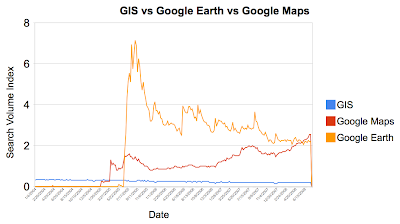 Running GIS, Google Earth and Google Maps through Google Trends throws up some interesting results. The launches of both Google Earth and Maps are instantly noticeable with Google Earth proving by far the most popular search term. Thanks go to Alex from spatial-literacy.org for the Google Trends tip. Google Trends is a measure of search trends only, and I think it is very dangerous to infer anything from this data. Google Maps is a web based service, so people will continually search for it when they want to use it. On the flipside, people might search for Google Earth once, in order to install it, and then they know where to find it on their desktops. Also choosing an all time indexing baseline causes very obvious spikes when something suddenly exists. The “decline” in Google Earth suggests to me that it’s now established, not waning. Yep agreed, although i do get the feeling that Google Earth is slightly losing popularity after the initial ‘wow’ factor. Yet Google Maps is ever on the rise. What is interesting is the almost constant low level search for GIS yet behind the scenes of Google Maps and Earth all the work is GIS based.